One of the side effects of smoking is that you are more likely to get gum disease, and your gum disease will worsen more rapidly. Your gums may swell and bleed, particularly when you brush. 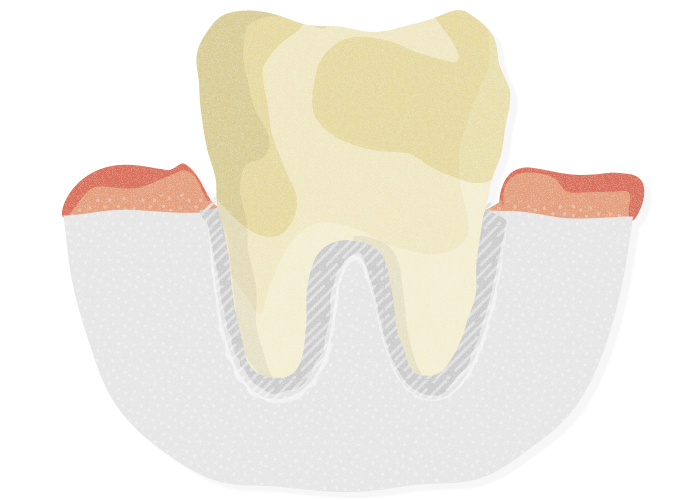 The bone holding the teeth in place can start to slowly shrink away, especially if you continue to smoke for a number of years. This bone loss continues to progress, and after many years some smokers may lose their teeth. It's best to treat gum disease early, ideally before you do any permanent damage. What Can I Do to minimise harm? See your dentist regularly - If you smoke you may have gum disease no matter how well you clean your teeth. Your dentist can clean the gums to make them healthy again. But the best way to avoid these problems is not to smoke at all! A major problem with smoking is that it tends to disguise the damage taking place to teeth and gums. The Australian Dental Association Dental Health Week Website provides further information about the role of nicotine in gum disease, loose teeth and oral cancers. Water helps you stay healthy and it is important to replace the water our bodies use. This factsheet from Nutrition Australia explains why water is important for good health, especially when quitting smoking. The Australian Government Quit Now website provides further facts and information about the damage that smoking can do to your oral health, including periodontal disease, stained teeth and tooth loss. Getting the right help and support can go a long way to ensure that you’re able to quit for good. Many free advice and support services exist to help smokers preparing to quit, and recent quitters stay smoke free. The Quitline and Quit Coach are two proven support services that can help you. Information about these services is available via the Quit Now website.